The Arabic Language is the words that the Arabs use to express their intentions. It (the Arabic Language) has come to us by way of transmission, by way of the Noble Qur’an and Hadith which have preserved it for us, as well as by way of reliable sources from among the prose and poetical works of the Arabs. When the Arabs became fearful of the ruination of the Arabic Language after they began to intermingle with foreigners, they started to write it down, compile dictionaries and firmly establish its rules in order to preserve it from errors. These rules or principles are known as the Arabic Sciences. The sciences of the Arabic language are sciences through which the aim is the preservation of the tongue and the pen from mistakes. They are thirteen sciences: الصَّرْفُ (morphology), الإعراب (analyzing and parsing sentences / word inflection), الرّسم the basic rules for writing words, الْـمَعَانِـي rhetoric, الْـبَدِيع metaphors, العَرُوض prosody, الْقَوَافِي rhyme, قُرْضُ‮ ‬الشِّعْر recitation of poetry, الإنشاء composition and style, الـخِطَابَة speech delivery, تاريخ الأدب‮ ‬literary history and متن اللغة the core text of the language. The most import of these is morphology and the analysis and parsing of sentences and words. Arabic is a name applied to the Classical Arabic language and the descendant forms from both the literary and spoken Arabic dialects. an-naḥw النحو (syntax) primarily concerned with inflection (ʼiʻrāb) which had already been lost in dialects. The grammar or grammars of contemporary varieties of Arabic are a different question. Said M. Badawi, an expert on Arabic grammar, divided Arabic grammar into five different types based on the speaker’s level of literacy and the degree to which the speaker deviated from Classical Arabic. Badawi’s five types of grammar from the most colloquial to the most formal are Illiterate Spoken Arabic (عامية الأميين ʻāmmiyat al-ʼummiyyīn), Semi-literate Spoken Arabic (عامية المتنورين ʻāmmiyat al-mutanawwirīn), Educated Spoken Arabic (عامية المثقفين ʻāmmiyat al-muṯaqqafīn), Modern Standard Arabic (فصحى العصر fuṣḥā l-ʻaṣr), and Classical Arabic (فصحى التراث fuṣḥā t-turāṯ). This article is concerned with the grammar of Classical Arabic and Modern Standard Arabic exclusively. The EFAL English program has been specifically developed to bring English-speakers from the basic to the advanced level of Arabic proficiency and usage, and Arabic-speakers from the basic to advance level of English proficiency and usage. Classical Arabic refers primarily to the language of the Qur’an, and to the language used in the various texts and works that are directly inspired by it (the Qur’an). Classical Arabic evolved over time out of a group of a diverse of closely related dialects spoken by the various Arab tribes. called fuṣ-ḥā Classical Arabic which in the Arabi called fuṣ-ḥā, extends in usage from the pre-Islamic era to the Islamic period and beyond as the lingua franca of scholarship and learning. Before the Islamic period, the language the Arabs spoke was an unadulterated variety of Arabic in which the Quran was eventually revealed. Therefore, when we use the term Classical Arabic, we simply mean Arabic as used in the Quran. The Classical Arabic course is not conversational studies, although the Arabic that is learned in it can be used for conversational purposes. Our approach focuses on the development of grammar and translation skills. We will be using the Grammar Translation Approach (GTA). The learning medium will be English and Arabic and will focus on learning the rules of classical Arabic grammar and other important aspects of the Arabic language. The course will also focus on the best translation techniques from Arabic to English. We will refer to these translation techniques from this point on as Composition and Style. Although we absolutely support the idea of using Arabic for the purposes of communication, teaching Arabic as a Second Language (ASL) is not our prime objective. Our approach focuses mainly on grammar, and therefore the student is given more written exercises such as essays, summaries, translations, and dictations. The learning of Arabic through the Classical Arabic Course will be more academic and literary in character than conversational. However, in addition to grammar, we will also focus on the other four language learning skills of reading, writing, listening and speaking as separate course modules. During the course of studies, we will also focus on accurate pronunciation and diction through the use of the rules and techniques of tajwīd. For those who want to speak Arabic in the future, this will build a suitable foundation for the development of good communication skills and Arabic diction later on. Classical Arabic is the foundation upon which all other versions of Arabic sit, whether it is Modern Standard Arabic or the various Arabic dialects. We believe that the learning and preservation of Classical Arabic in its purity is as important in this modern age as it was in the age when Classical Arabic was the lingua franca of scholarship and learning and the lingua franca of nations and cultures. The true learning of Arabic is not done “in an instant” however. It takes time. In fact, it sometimes takes the span of a lifetime. The study of Classical Arabic is for those who pace themselves like long distant runners, rather than short distant sprinters. Our Arabic courses have been structured for the students to gain mastery of both classical and modern texts and for them to develop strong communication skills. The courses of the Arabic Program have been specifically developed and designed for English-speakers. The Arabic Program offers a transitional learning approach. This means that our students start their program by learning at the beginning and intermediate levels in Arabic and English, and are gradually transitioned to learning the advanced levels of Arabic in the Arabic language only. This instructional approach allows for a seamless and smooth transition from English and Arabic as the first mediums of instruction to complete Arabic as the main medium of instruction. It also ensures that the students clearly understand the rules and structures of Arabic in their own language so that no learning gaps occur. At the advanced level, the students will be able to apply their already acquired skills in the Arabic language solely. From our past experiences, we have seen that full immersion programs have the tendency to leave learning gaps with students because they are not allowed to use their native language in the immersion setting to ask vital questions about the target language. On the other hand, our transitional learning approach allows the students to ask questions in their native language which helps to clarify vital points regarding grammar and vocabulary. if these questions are left unaddressed, this may cause learning gaps that ultimately undermine the full understanding of the Arabic language and its subtleties. Our Arabic Courses focus on intensive language learning and specialized area studies and training. This course aims at building the student’s Seven Language Skills: Reading, Composition and Style, Grammar, Listening and Interpreting, Speaking, Pronunciation and Diction (Tajwīd), and Translation. ➢ Increase the student’s ability to translate accurately by showing them how to avoid translations which are either too literal (representing the exact words of the original text) or too figurative (that is to say: free from exaggeration or distortion). What is Modern Standard Arabic (MSA)? Modern Standard Arabic (MSA) is the modern counterpart of Classical Arabic, the language of the Quran. Modern Standard Arabic is learned as a primary language at all levels of education in Arabic speaking countries and listened in TV and radio broadcast. It is also widely used in print media, official documents, correspondence. It is the official language of 22 Arab countries where it is used in its oral and written form and especially on formal occasions. The geographical span of Modern Standard Arabic encompasses the northernmost part of Africa from Mauritania to Egypt, the Levant, the Arabian Peninsula, and Iraq. It is estimated that some 165,000,000 people throughout the Muslim world have some knowledge of Modern Standard Arabic. The main difference between Modern Standard Arabic and Classical Arabic lies in the vocabulary. MSA reflects the needs of those who use contemporary expressions while Classical Arabic reflects the needs of those who use Arabic for traditional scholarship and religious ceremony. With the growth of western knowledge in the Middle East and North Africa and the rise of the printing press and the media and the film industry and modern social development, classical linguistics were expanded to fit the modern situation. Modern Standard Arabic as a standard of acceptable Arabic became the link between modern society and classical Arabic for the majority of people in the Arab world. The changes made in spoken and written Arabic by the educated elite of the Arab world has resulted in the development of what we today call Modern Standard Arabic. Modern Standard Arabic as mentioned above has evolved from Classical Arabic, and therefore both are pretty similar. However, first-time Arabic learners would probably be better off starting with classical Arabic so that when they begin learning Modern Standard Arabic the transition will be an easier one even from a comparative point of view. Because of the various colloquial dialects as well as the influences of foreign languages, such as French in North Africa and Lebanon or English in Egypt, Jordan, and other countries, Classical and Modern Standard Arabic are not acquired neither in the Middle East nor North Africa as mother tongues, but rather they are learned as second languages at school or through exposure to broadcast programs, print media and religious ceremonies. The EFAL Arabic for Native Speakers Course is therefore aimed at students who do not have the opportunity to study Arabic at school, or who have been brought up in an Arabic country but not educated within an Arabic-medium school or who attend an Arabic-medium school but need further after school assistance in their Arabic studies. The EFAL Arabic for Native Speakers Course is aimed at students who are seeking a professional career in Arabic-speaking countries or who want to continue their postgraduate studies in Arabic. This course consists of 20 – 30 hours of Basic Survival Arabic. This course will enable a new student or tourist to speak and comprehend enough of the local Moroccan dialect called daarijah – in relation to their business and personal interests while staying in Morocco. The course will enable them to use daarijah in hotels, taxis, restaurants, stores and as needed in any other situation. The student will learn to understand short and simple phrases and be able to pick up frequently used words and phrases that are necessary for conducting personal business, having a general conversation, as well as being necessary for day to day social interaction with the people of the local area they will be staying in. Free tutoring and homework assistance by appointment. 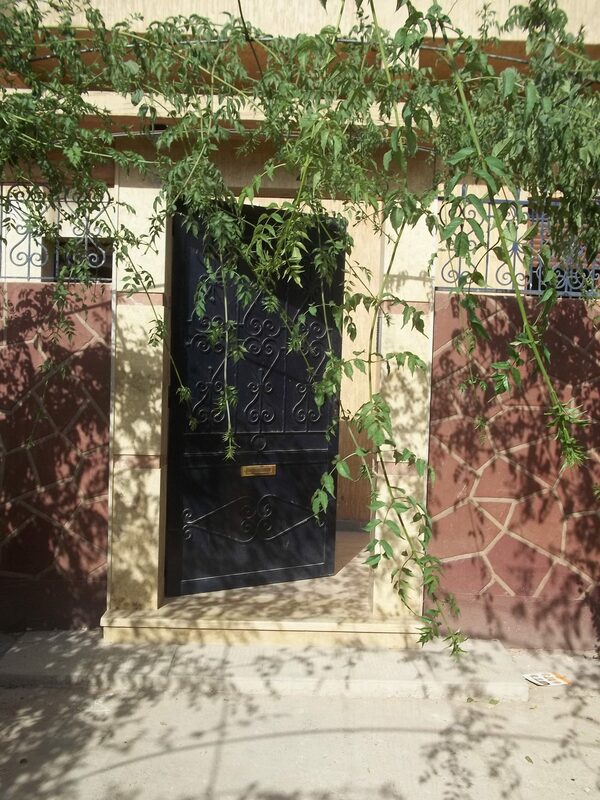 Our courses, services, and products related to both the English and Arabic language are offered at our beautiful center in the quiet neighborhood of Sanaoubar in Marrakesh, Morocco. This is our Building. You can’t miss if you use the map below. Click on the Map Picture below to get traveling directions and a satellite visual of EFAL Center Marrakesh.